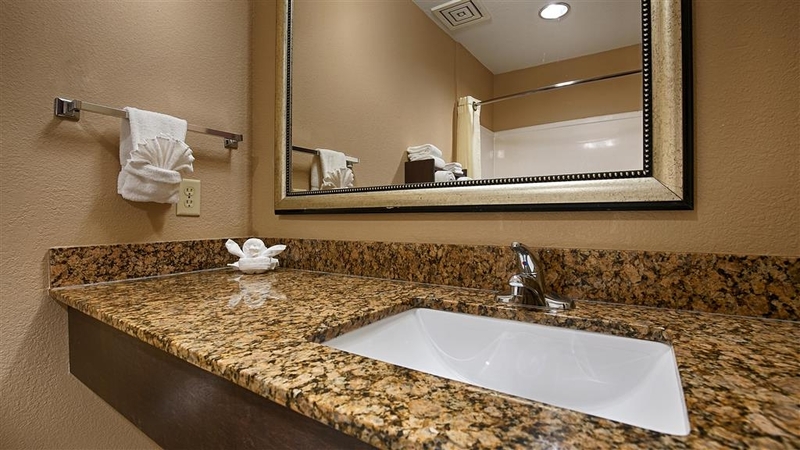 The Best Western Bayou Inn & Suites is ideally located in the center of Lake Charles. Come and experience our hotel near the major tourist attractions. Best price guaranteed and exclusive deals. Welcome to Best Western Bayou Inn & Suites. No matter what time of year, we know you will love the Best Western Bayou Inn & Suites. 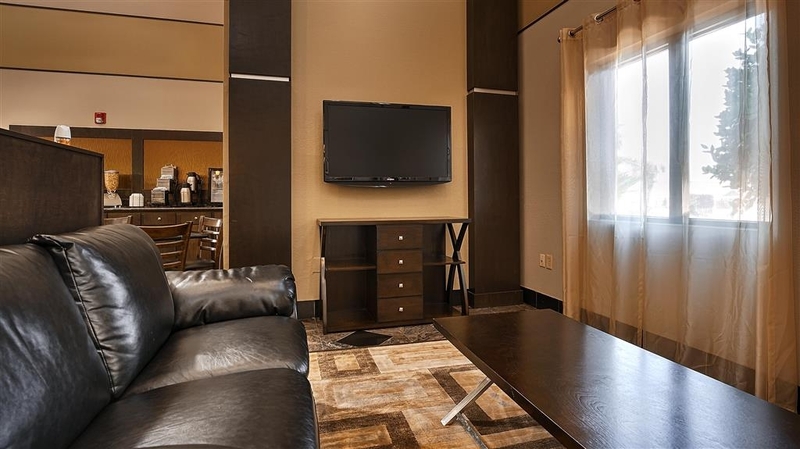 Settle into one of the comfortable couches and watch your favorite local show. 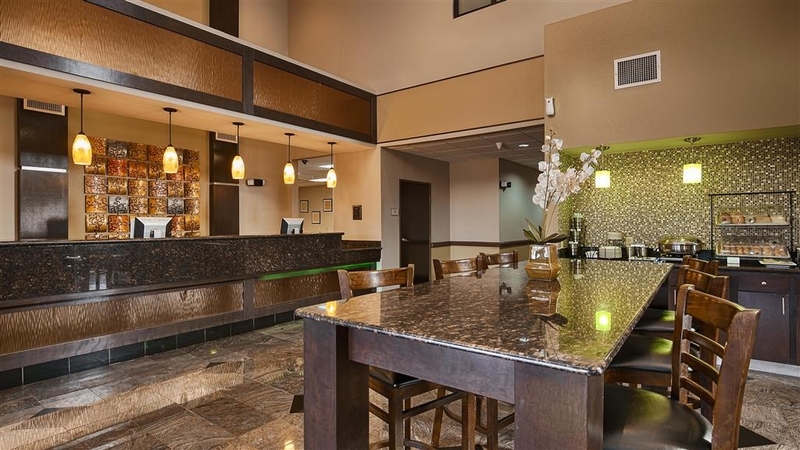 Catch up with friends or colleagues in our hotel lobby. Print itineraries, flight details and work emails in our business center. 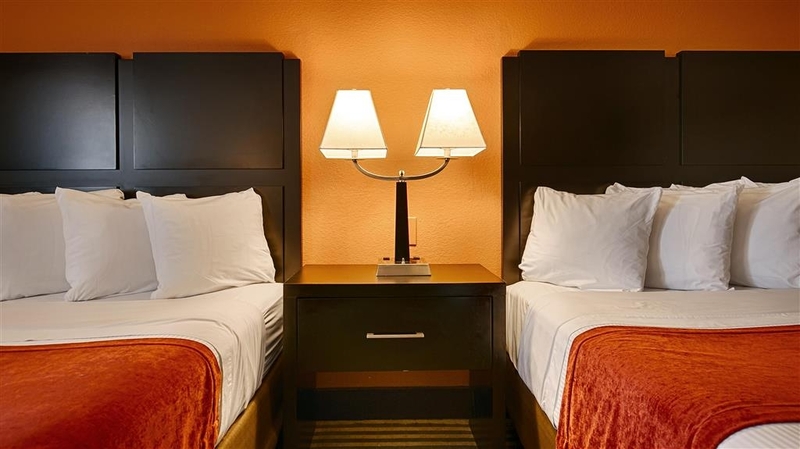 We offer a variety of bedrooms from single kings to suites to standard queens and and two queen bedrooms. 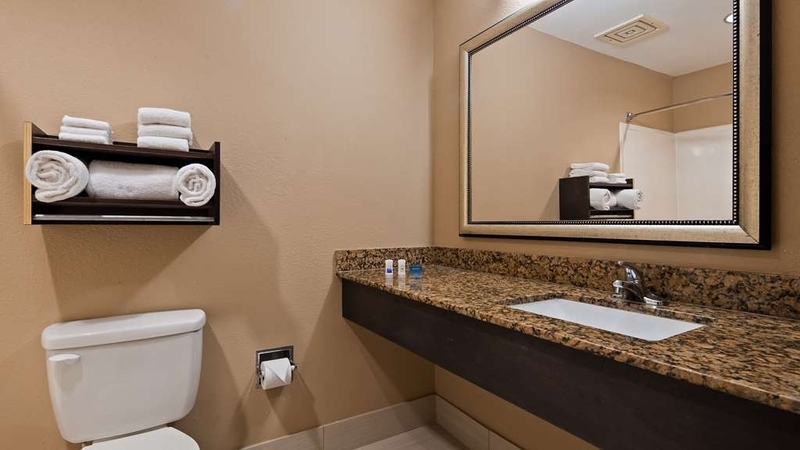 We offer plenty of space in our mobility accessible king rooms. 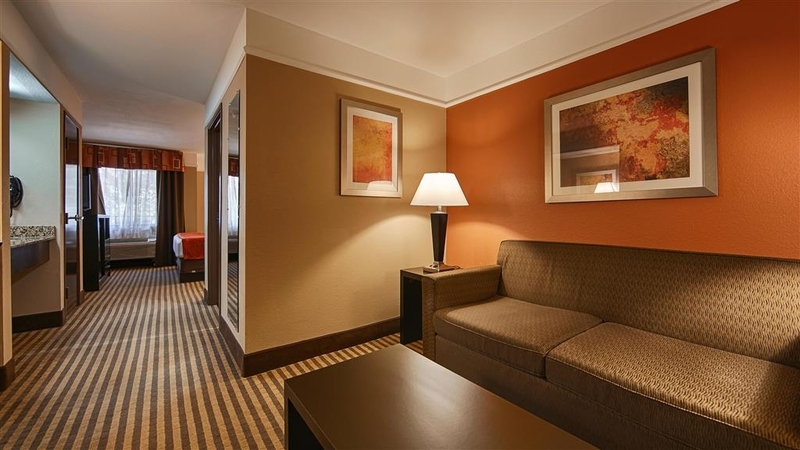 Our king suites are the perfect location if your here for business. 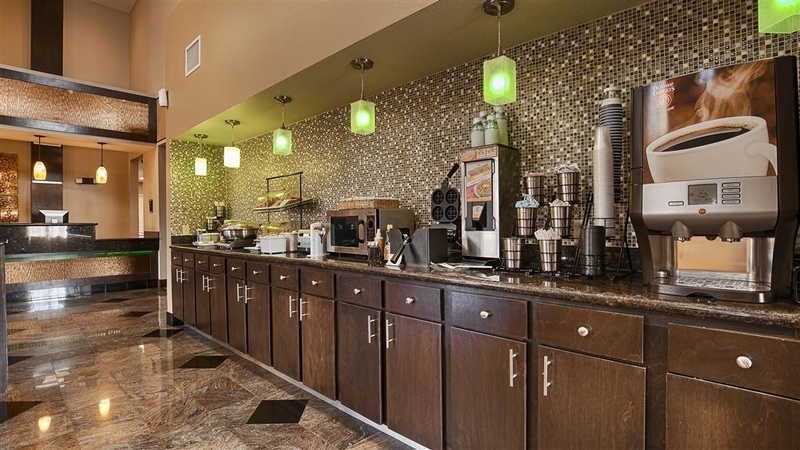 Fuel up on a complimentary breakfast before heading out to Lake Charles best attractions. Welcome to Best Western Bayou Inn and Suites! 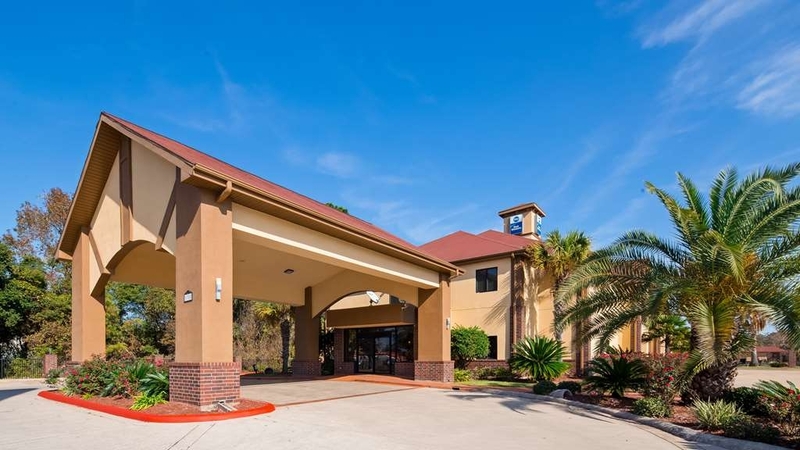 Located off of I-10 Exit 33, our Lake Charles hotel has a superior location that puts guests close to all the top attractions. The beaches are nearby, and nothing beats a vacation where sand and sun are in abundance. However, if you'd prefer a cooler trip, visit the casinos in the neighborhood for games of luck and plenty of entertainment. We are very easy to find, less than one mile from the exit, with a great highway location. 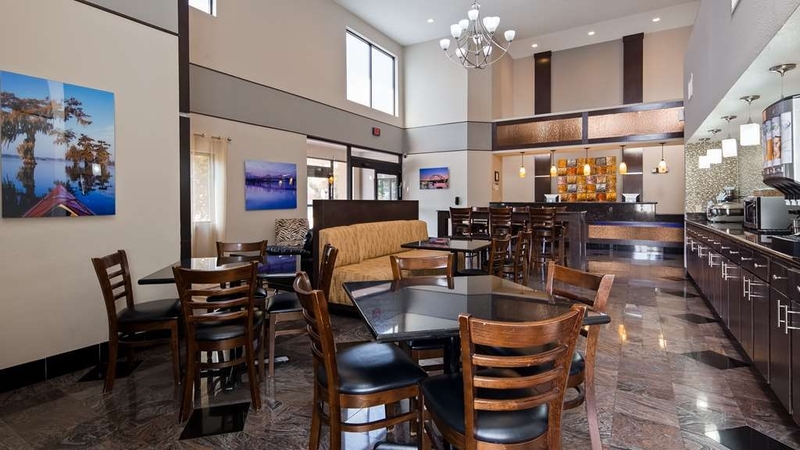 We're on a main highway with many local restaurants nearby, so guests at our Lake Charles hotel don't have to go far for a great meal. Our staff is knowledgeable about the area and is happy to help guests decide on things to do, restaurants to try and which attractions are a must-see. Southern hospitality is our specialty, and we'll treat you just like family. 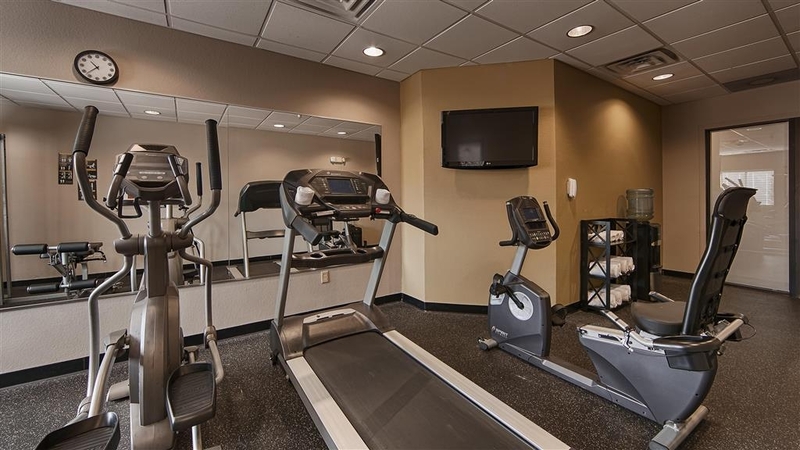 We're within minutes of both casinos, and our Lake Charles hotel is a preferred property for guests looking to test their luck. Fishing and hunting also bring many travelers to the area. 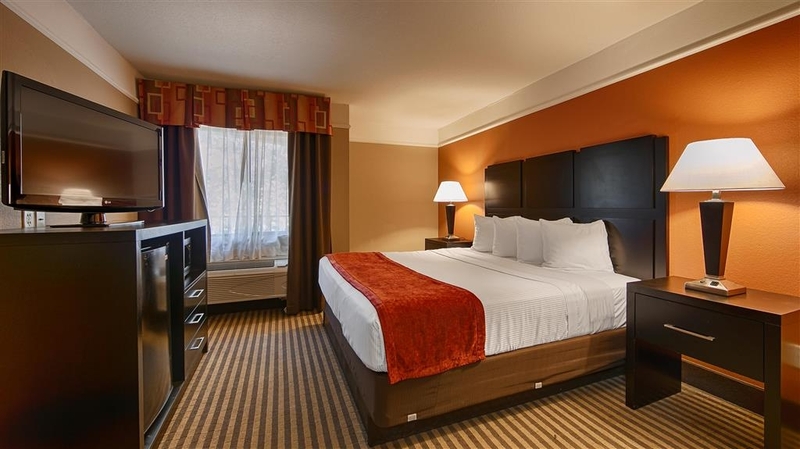 We're happy to accommodate groups during the hunting season, and the spacious rooms make it easy to bring all your gear. Whether you're here to take to the water for swimming and fishing, you deserve a hotel that's comfortable and cool. The nearby racetrack is a favorite destination, and Lake Charles hotel guests can't get enough of the special events. We're located very near the interstate, so we're within minutes of most tourist attractions, restaurants in Lake Charles and Sulphur. Nearby Vinton is where the Delta Downs Racetrack is located, and it's a quick and easy commute from our property to view an exciting horse race. 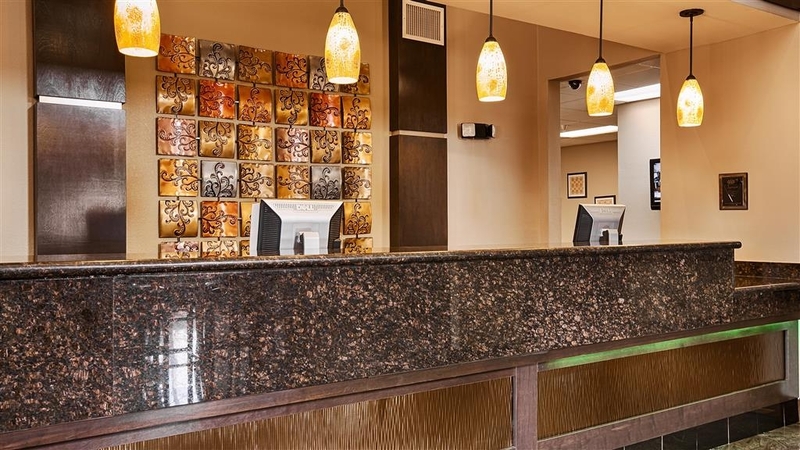 Business travelers with L'Auberge Casino Resort, Isle of Capri Casino, Golden Nugget, and Delta Downs often stay at our Lake Charles hotel because they know we offer the best service, location and value in town. Save on your next trip, whether it's for business or a vacation. 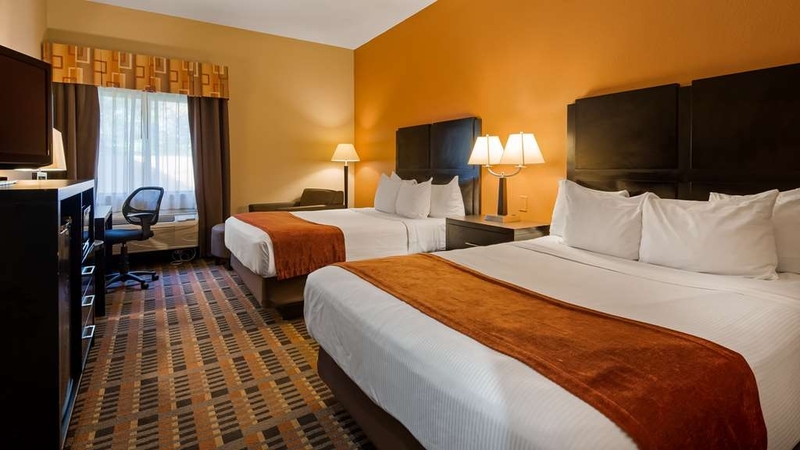 Book your Best Western Bayou Inn and Suites room today and take advantage of a great deal! Enjoy your stay. 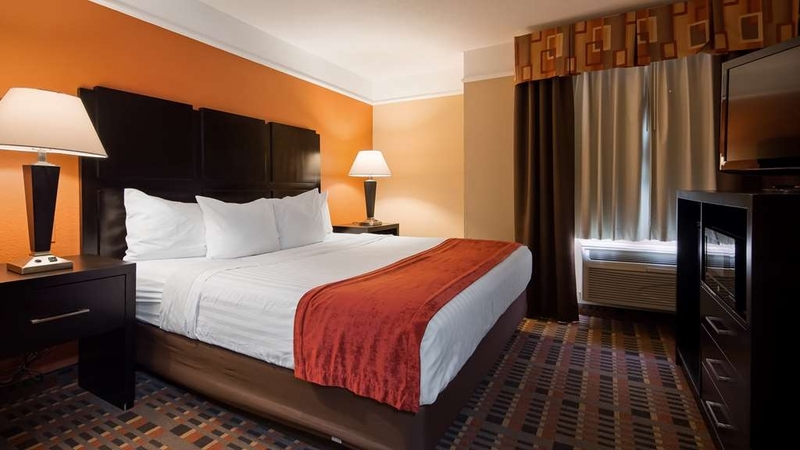 "A comfortable rest oasis in Lake Charles La." The Best Western Bayou in Lake Charles La. is a diamond in disguise. Coming off I-10 the first thing you see is the large blue BW sign. When turning into the entrance the Lobby overhang is very inviting to a sore weary traveler. 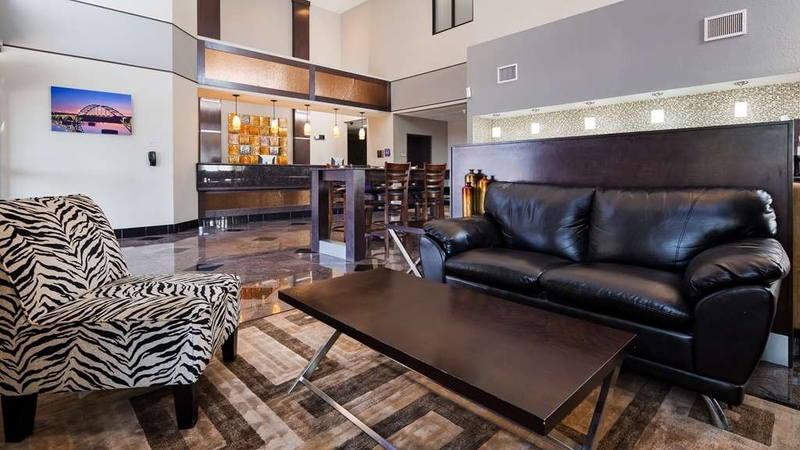 But once you enter thru the lobby automatic doors..... your composure is changed to a relaxing experience with the staff being your guide to a leisure resting adventure of your stay in Lake Charles La. The breakfast selections are plentiful and freshly prepared,and the morning staff is always ready to comply to any request that is needed. We have stayed at this hotel on our last 2 trips to Lake Charles. It is easy to access. The facility is clean, well decorated and quiet. We have never had any complaints. The staff respond promptly to any requests. The complimentary breakfast is great with plenty of options available. 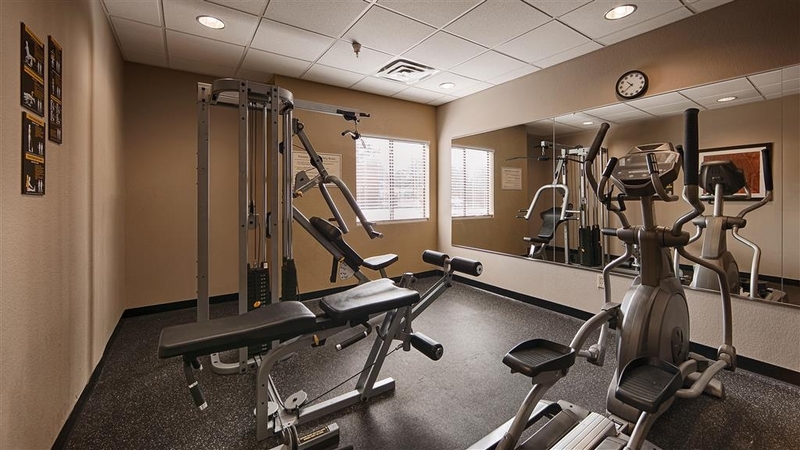 We have not used the pool or fitness center, but they look like a great option. We will definitely stay here again. This hotel is in need of many updates and upgrades. The bed was like sleeping on concrete. There were bugs, it smelled, and breakfast was awful. No hot water! Staff was very helpful and attempted to resolve the problem by allowing us to move rooms however, we just checked out early. "Labor Day stay at BW"
I was expecting, maybe too much. The hotel looks just like the website, it's really nice when you arrive. I soon found out the hotel was outdated a had been renovated some years back. The "SMELL" is real and I think the staff is just used to it. We stayed two nights and my room did not get serviced, and the front desk could not tell me why, I had to request fresh towels, and the ice machine was out of order as well. we will not return to this location again. "Good hotel but smell like smoke"
My husband and I were there to take in a concert. We stayed one night. The front desk staff was very friendly and helpful. The room was clean and the bed was very comfortable. We would stay again if the need arises. This BW looked great outside & inside. Our king size was very roomy. Everything worked as expected. We got everything we asked for. We had no problem getting all our "junk" upstairs with the cart & elevator. Our room was very quiet. When I told them my wife was there for birding, we were given a room with a view of trees. The breakfast consisted of the usual eggs & sausage, waffles, several types of breads, rolls, apple & orange juice, fresh apples, oranges, & pears, yogurts, etc. the staff was friendly and helpful. The only negative was that being a n/s we got large doses every time we stepped out in the hall. This BW is definitely on our list. Everything I needed for an affordable price. 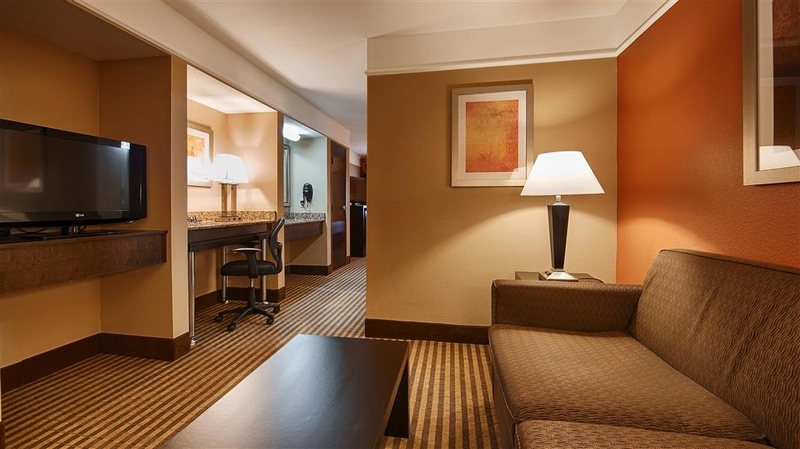 Weekend hotel prices in Lake Charles are generally very high due to the casinos, and BW is a good value. The location is convenient. Everything was clean, quiet, and functional. 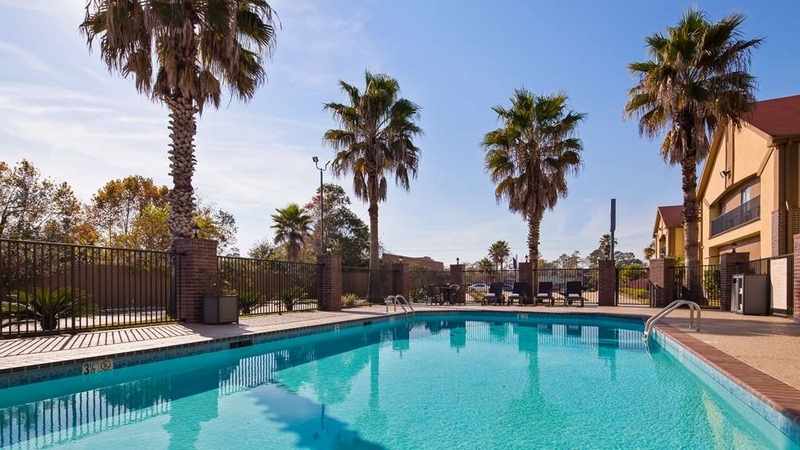 Very clean,right off the freeway, Close to all the major casinos. They do have smoking rooms.....the rooms are very nice and spacious! Friendly and helpful staff. Didn't get a chance to get breakfast before we checked out because the beds are supper comfy. Thanks, I will be back. It was great. Very good location that is right off the interstate. Very nice staff. Breakfast was yummy with the bacon and fried eggs. Super clean rooms and very lovely landscaping. Check in was quick and check out was easy. "Not enough stars for this hotel!!!!!" Cannot begin to fathom the few bad reviews. This hotel AND staff is first class. I am on the road, a good part of the year. I am no stranger to hotels. This room was a. Large,spacious suite. There is a livingroom, when entering, nicely furnished with aflats green tv and business desk. Bath and dressing area seperats living room and bedroom. Comfortable bed. And pillows, nice linnens and large flat screen. There is micro,fridge and coffee maker. The staff is very professional, dressed well and extremely dedicated to making your stay the best. Wi-Fi is strong and breakfast is great. This hotel is secure, well fenced, and cameras everywhere. The parking lot is well lit, and grounds are immaculate. This is a town with some very iffy hotels. This being a diamond in the rough. I will always stay here when in area. The rate is very competitive and it's quiet and free of most noise. Thanks Sarrah and rest of staff for great stay. "It was a pleasant surpirse"
We stayed because we like Best Western hotels. We had stayed at this one before and enjoyed the suite so we checked in again this time. There was a problem with the second TV in our suite so we couldn't use it. The breakfast was bland and the internet service was horrid. The internet was so bad we used the hotspots on our phones. For the value and if you are only staying one or two nights this is a good place in the area for the value. Hi Nelda, thank you for taking the time to write a review about your most recent stay. I see there were a few issues while you were here, and I just to apologize for the inconvenience. We strive to ensure a pleasant experience for each and every guest. I hope you give us another opportunity to earn your business in the future. Thank you, Management. The worse Best Western ever. Not a pleasant experience. Would never have expected Best Western to be this disgusting, it was dirty and stunk. Parking was awful! Best Western has always been hotel of choice, but no longer! What was an emotional trip to begin with wound up being even more disturbing because of this hotel experience. Clean, convenient, well located, and safe. Staff are always friendly and professional. Parking is safe and clean. There are many places close by to eat, Walmart is just down the road for last minute items, and down town is close. On our way to the family reunion, we decided to stop in Lake Charles and take in a show at the Golden Nugget Casino. We needed a budget-friendly hotel for the evening and chose this one. It turned out to be a good choice for my wife and me. The location was close to (but not on) the freeway and was only about 12 minutes to the Golden Nugget. I look for a price around $100, convenient and safe location, complimentary (hot) breakfast, and good reviews. This place had all that. The "hot" side of breakfast included bacon and eggs cooked in an oven, make-them-yourself waffles and toast. What I hope to get also are a comfortable bed and speedy WIFI internet. The bed was comfortable enough for one night. The WIFI was acceptable--around 5 Mbps speed. The room was spacious and comfortable. In our case, there was a kind of living room with couch and chairs and coffee table. That came in handy because my wife needed to wrap some presents. The middle of the room included a desk area and the sink (which was not in the bathroom). This is also where the bathroom was. We didn't request an accessible room, but it seemed to be set up that way. The back of the room included the bedroom area and closet along with a microwave and small fridge. All of it was handy and useful. LED TVs were in the bedroom and living room areas. In the end, it was a good choice for us and we enjoyed our relatively short stay there. 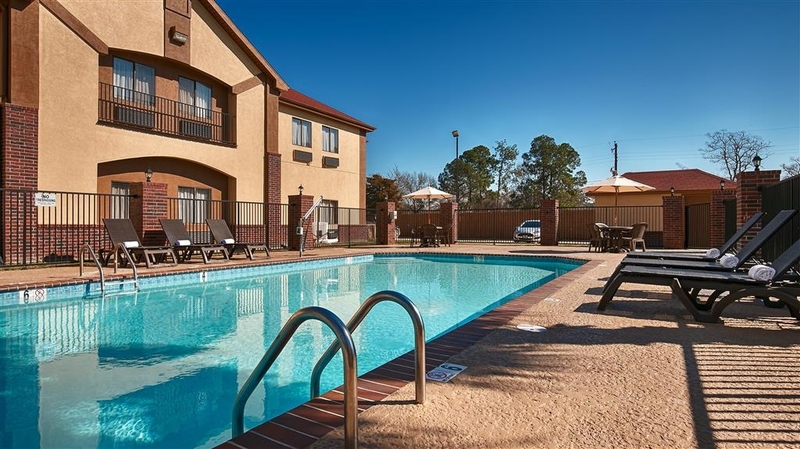 "Clean and comfortable at a good price"
We have stayed at many different hotels in Louisiana and they are general very used and with a minimum of maintenance. This hotel was refreshingly different. Clean, elegant and quiet. The breakfast was worth waiting for too. I have stayed at numerous Best Western Hotels and have not experienced before the issues we encountered here. Dead bugs on sheets, stained sheets (appears to be grease stains). Roach in bath tub. Check-in clerk must have been having a bad day, She was short when we checked in. Stayed only because it was late and most other hotels were full. This is a great stay as always with this location. The staff is caring and professional. The location is close to where I need to be and easy to get to close to the freeway. There are restaurant near by. We were evacuated because of the hurricane and didn't have anywhere to go. We found this hotel at the last minute and very glad we did. All of the staff were a big help throughout the whole process. When we found out that we needed to stay longer the manager Goldie bent over backwards and was very professional in helping us stay put. This is a very stressful time and she didn't have to do what she did. I will continue to stay at this location from here on out. I came in the middle of a hurricane and stayed three days. I expected chaos but found a calm staff who did their jobs and made my stay pleasant. The breakfast was good, the rooms clean, the bathrooms were very clean. The bed was soft, yet firm and the room temperature was customer controlled. The location was near the cheapest gas in Lake Charles, La. And there were a number of good restaurants nearby. I especially appreciated the Mexican restaurant in the middle of a small strip mall less than 1/2 mile away that was very good. But best of all, was the reasonable room pricing. Very competitive and fair. All in all, a very good stay. First, I must say the staff was very nice, and went through the motions of helping and being professional, but - the room they gave us was the worst smelling room I've ever walked into. The musty, very moldy odor was overwhelming, I mean we could barely breathe. My problem is they knew this and tried to sell us this room. We got another room, and tough much better, still smelled, as did most of the interior of the property. Would return and recommend. Breakfast was good. Parking good. Staff excellent. No hidden charges. Noise level low. Bed could have been better sagged in the middle. Eggs were powered, I personally enjoyed them with Louisiana Hot sauce. "Reasonable price . Personnel very nice." The place is clean but the smell when you go in the room is not really nice. Musty, moldy smell is what I smelled . But personnel really nice and their free breakfast layout is good for the price. The backdoor to the hotel is not secure. not locking. Anybody could just go in the place. And our room is the second room to the back . I was a little bit scared. Our one-night stay was terrible. The air conditioner did not work properly so there was a continuous stale feeling in the room. We also found not one, but THREE bugs during our stay (two in the beds and one spider in the bathroom). When we informed the staff, all she said was, "Well we are in Louisiana.....". I was very disappointed with this stay and will never stay here again!! This place was Great! Front staff was very helpful. We has a King Suite room it was a beautiful room, great bed, soft comfy towels. The breakfast was good, but could of used, a few different pastries. And I do wish the Ice Machine had not of broken down the day before we got there, but over all we would stay here again in a heart beat. 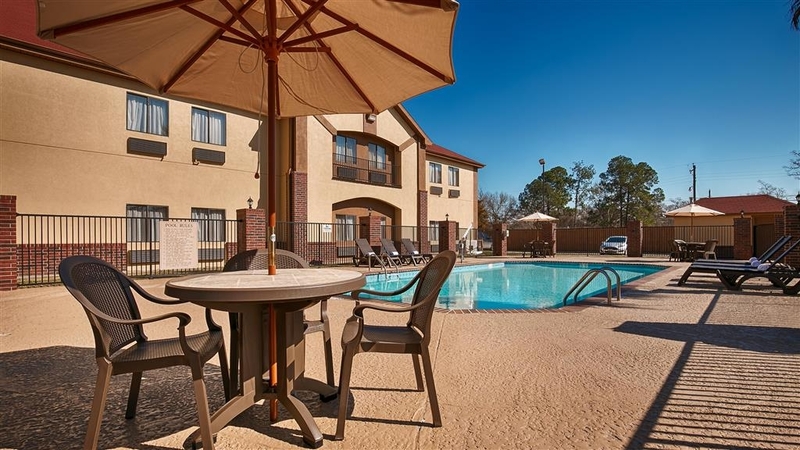 "Convenient, Clean and Decent Value..."
A clean, well maintained property that has all the amenities that a traveler would expect in a moderate price range. Rooms have decent room for three people to move around in and are clean and comfortable. Beds and pillow are very decent quality and assist with a good nights sleep. Great value .Clean hotel, good night's sleep. Friendly staff, comfortable beds, pillows and rooms. Fresh clean smell throughout hotel. Close to several eateries and 5 mins from downtown. Would stay again. The staff was courteous and friendly. The room was very clean and the bed was very comfortable. The room has a slight musty smell. But that is typical of Louisiana hotels so I was not at all surprised. I always carry air freshener with me wherever I go. The breakfast was by far the best part of the trip. They had a variety of items including eggs and bacon. The highlight was that they also had a toaster which actually toasted the bread and the bagels instead of just making them lukewarm. I definitely will stay again. It was close to stores and the freeway. This is a very nice place to stay with friendly staff. Very clean and the beds are so comfortable. I am a frequent guest and I am always treated so well by the staff every time. Highly recommend this place. "O'Jay's concert with friends. Great experience, would do it all again! Nice trip, nice stay, great service, great food!" In a great location if you want something fast food, gas, and convient stores! Was kinda far from the concert. This was discovered when we went to concert. Great time and fun was had by all who attended and stayed. Excellent staff and accommodations. Sam and Alecia were so supportive. The room is very comfortable and clean. The breakfast has so many different treats to choose from. The eating area is kept very clean. Awesome service Very nice property for the money. Will stay again. Front desk staff was very helpful and eager to help. The property was well maintained and staff seemed to be focused on customer service. I stayed here en route to Austin from Alabama and booked ahead. The room was long and skinny but worked OK. The bed was acceptable and the place was clean. The front desk staff was helpful and friendly but the area around the hotel felt a little sketchy. Nothing untoward happened, the room was quiet enough and the breakfast was the usual bland and boring fare we've all had before. A pretty good value, overall. Rooms were DIRTY! We moved rooms 4 times. Spiders in the first room, dead bugs on the bed of the 2nd room. 3rd room I told front desk lady to go with me to check the other room. I lifted up the sheets and stains everywhere of who knows what. The owner obviously is cheap and doesn't invest in his business . No wonder we were the only ones staying there. I would have gone to another hotel but we checked in late after a long drive. We just wanted to sleep. Traveling from Alabama back to Texas. Booked room online. Rating was good. But we did not experience the same. AC was making noises in our room & upstairs. Room had an odor. Bathroom was not clean Breakfast was good. Took a road trip from Nebraska to Louisiana to see the Gulf. My parents used to always stay at BW hotels so we took a shot at this one. Very clean, well-cared for, quiet. Room was in really good shape, bed very comfortable. Staff gave us directions to the best beach and dinner recommendations that were right on. Pretty good breakfast (hey, it's a free hotel breakfast) with hot protein options. This was the best place we stayed out of four motels on the road. 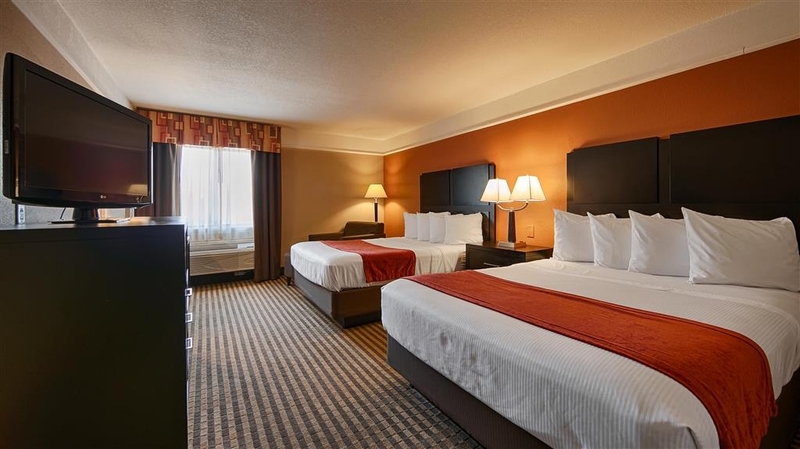 We also got a great deal on the room since we were traveling off-season and mid-week - an excellent value for the price. The motel is easy to get to off of I10. Personnel are friendly and very helpful. The room was comfortable especially the bed. Breakfast was very good but no bananas this time. I like to stay here when I have to stay in Lake Charles. I enjoyed every bit of my stay at this hotel. Even though they were replacing the carpet it was a pleasant stay. Great pool, fitness room, and Great staff. I left another hotel where I did not feel safe to come to the Best Western where all rooms are inside and I felt completely safe. Nice, clean, modern hotel just off I-10. Would recommend it. My family and I were on the road from Miami, FL to San Antonio, TX. We were tired and feeling grimy and wanted a nice place to lay our heads. We found it here. "They missed it this time"
The night audit lady, I think her name was Ms Julia? I know it started with a "J", she was so kind and very welcoming. Her customer service was a 10! However, once we arrived in our room; of which was very late past 11pm, we fell right asleep. This is where the nightmare begins. Around 1 am, I started hearing this loud non stop clicking, come to find out it was the fridge. I was unable to disconnect it and did not want to wake my friend with lights being turned on. It was a lost cause because this was the last room available in the hotel. I did not get any sleep. He however did because he is a heavy sleeper. Other than that, the staff & rooms are still very nice (5 Star service). We have stayed here before and will stay again when in the area. I wish we could have had somewhat of a discount due to the inconvenience. Hopefully management will reach out to me. A bit pricy for this hotel.. in surrounding area wasn't so good.. Breakfast was good. Staff very friendly but the carpet wasn't clean and we had to wear shoes getting out of the shower. Other than that we had good sleep and good food when we woke up. As some other reviews note.. The housekeeping and maintenance crews were very helpful and friendly. The front lobby area is nice. When crowded at breakfast, there isn't any room or flow. AC froze us out (a good thing). Bath/shower area need new caulking as there is mold/mildew present. The shower curtain had been washed, but old stain remain s. The back door does need replacing as it does tend to stay open. Our bed was comfortable. Not too far from casino areas. Would stay here again. "DO NOT stay here!!! I fell on a very wet floor-they won't pay medical bills. Lousy!" I fell in their lobby due to a soaking wet floor and they won't pay my medical bills. They have a below average UNSAFE property and if you get hurt there they will not even help you up, or pay medical bills as the GENERAL MANAGER KAVITA PROMISED. I have been trying to get my bills paid for almost a year and had to hire a lawyer. I had to go to many Dr's appts, xrays, an MRI of my wrist and hand all cost $$$ and their lousy insurance co. will not pay me. I only asked for reimbursement, didn't get a dime 10 months later. I do get calls from bill collectors daily though! Average rooms, lame breakfast and smells of cigarette smoke when you walk in the lobby. Sketchy part of town. Stay elsewhere!! This Hotel needs to be more secure. The Emergency Exit door would never close on it's own. The back door stayed open all night long. The cleaning staff did a wonderful job. The front deck staff wasn't very friendly at all. There was water standing on the floor no one attempted to clean while I was present for Breakfast. The Breakfast was average. There was plenty of parking. But were people hanging out in the parking lot, it seemed like a tailgate party. I have stayed in BW hotels many times before. I am a rewards member. At this location, there was mold in the bathtub and the 2nd floor hallway had a strong cigarette odor. The breakfast was not what I was accustomed to at other BW locations. Very pleased with our stay here. Owners were on site taking care of the property. Rapidly dealt with a broken exterior door. 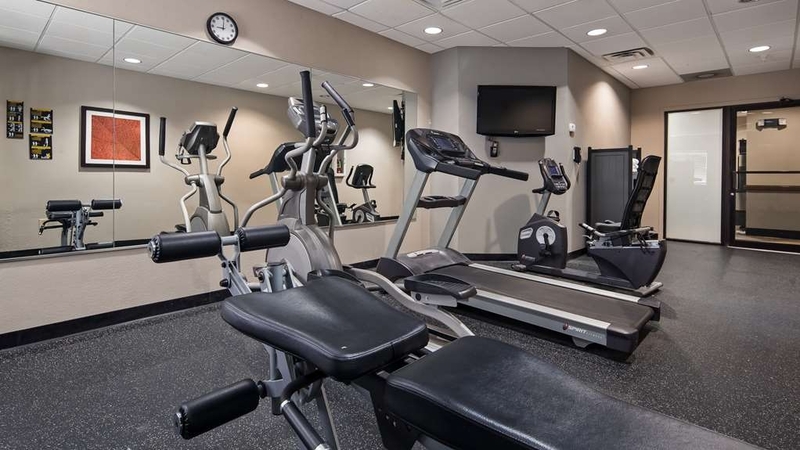 Conveniently located with a Clean, comfortable room. Would definitely stay here again. We were given a handicap room...not sure why. I paid in advance online and did get there early...but would have waited another 30min to an hour for a regular room. I wasn't given a choice. The room was "okay" nothing to brag about. The shower...because it was for a wheelchair was horrible. The water pressure and water all over the floor was a mess. I didn't get a chance to tell lady at the desk before I left...because there was only 1 person behind the desk and the line was long...was in a hurry...so just left. Probably would find another hotel next time I'm there...but we'll see. The Lobby is nice...too bad the rooms don't reflect that. "Nice small hotel - Staff needs "nice" lessons"
A nice enough hotel (two large screen TVs in the room with a comfy seating area in the room!!) Clean, tidy, and comfortable. No restaurants nearby - only Fast Food...hmmm... The staff needs to work on welcoming late night arrivals with a smile and reigning in a testy attitude, last I checked, 9pm arrival should not be considered such an inconvenience that it warrants snippy replies to questions. Also, breakfast area is tight and not the best set up for guests who are checking out and those wrangling for space to sit for breakfast. Not a bad hotel, just a bad, and VERY unusual experience for us at a Best Western. Stopped in without a reservation, no problem getting a room. The room was clean, the housekeeping dept. was very friendly and helpful. We had some trouble connecting to the wifi, but the front desk was able to fix it right up... Good breakfast, clean area. Sam is a gracious host...Would recommend this place to my friends..
At least the beds were comfortable. AC questionable. Walls are thin and can hear even the slightest noise from neighbors.Free breakfast is pathetic and yogurt was expired. Front desk clerks playing on cell phones. Not somewhere I would choose to stay again. "Short Stay; dont think I would return. " Lobby is nice; rooms are ok, however there is definitely an issue with cleanliness. Carpet was dirty, smudges on everything even the headboards the room appeared to be wiped at rather than cleaned. The pillows are tiny, the comforter is as thin as the sheets. Our friends and I stayed here for a day in spring break since rooms in the Golden Nugget and other casinos were ridiculously expensive. The hotel is in the middle of the city with everything you need nearby including a Walmart down the street. This was a nice stay. It is convenient to fast food establishments. Next time in Lake Charles I recommend this place. The breakfast was just a standard continental breakfast. It was not great but it was ok.
Beautiful Motel inside and out ! Fantastic cleanliness, Comfort with friendly, polite, helpful staff.What you get for the price is a really good deal. 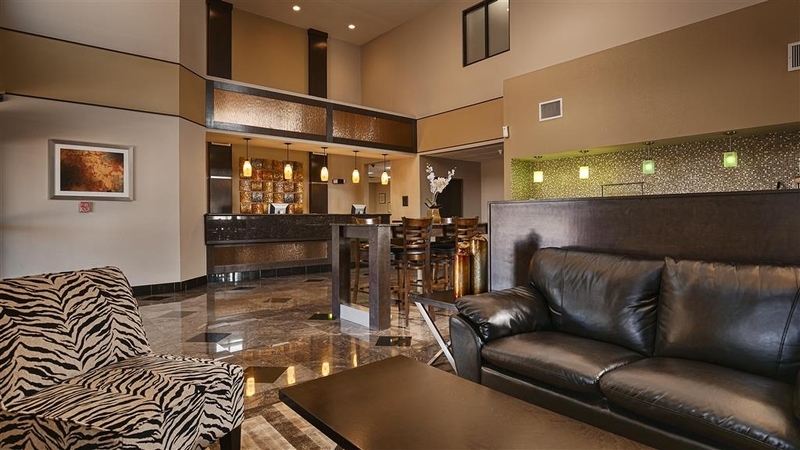 This is a very nice Best Western! I just didn't care for the breakfast-but its your standard Best western breakfast with everything frozen & pre-packaged and not very good tasting=same across the united states-besides that, I LOVE Best Western ! This hotel has a great location. There are fast food and other restaurant in the area. And if you're like me, there is also a Walmart near by, a great place to get snacks. The staff has a good attitude and helpful. Great place to stay even though it was a little out of way from casinos! Price was right! we had a King Suite and we felt like we were in a small apartment! Lots of space! Very clean and well serviced! There was an elevator issue but the staff took immediate steps to resolve the problem so no one was inconvenienced. Everyone really went out of their way to make it an enjoyable trip! We will return! upon check-in the desk clerk was very nice, polite and helpful. both the outside and inside looked pretty good and well maintained. the tv didnt seem to work in the fitness room, but the machines were all right. breakfast was good and filling. "Super stay to watch Super Bowl"
We were given a suite with all working amenities with one TV. I asked for the room with two televisions to watch the Super Bowl with friends. The whirlpool bath was out of service. I was satisfied with it not working and they changed my room. The room was very nice and had many different types of food restaurants that delivered in the area. Convenient shopping close as well. We stayed here because it was have way to our next stopping location. The room was nice but the bathroom has close quarters to the door. You can barely open the and not hit the toilet. If you are looking for a hot tub forget about it here. There are not a lot of close food choices other that fast food. Was assigned a smoking room and was treated like an imbecile when I asked for a non smoking room. The night desk person who checked me in rudely asked “why did you book a smoking room if you wanted a non-smoking room”? I got the feeling she was put off by having to take an extra step to assign me a different room. She finally did. The other issue I had involved the same employee. The room wasn't serviced by housekeeping. I called down to ask for fresh towels. The phone wasn't answered at the desk so I went down to ask personally, thinking she was busy and wouldn't be able to bring towels up to the room. Again, I was treated quite rudely and told there was no one in the room number I gave. I promised her I was checked into that room. She finally found it and because I had the door tag on past noon the room didn't get cleaned. I let her know it wasn't a big deal, I just needed clean towels for The next morning. At that point she told me I needed to bring down the dirty towels. I stay in hotels every week for work and have never encountered such a request. I'm guessing my face reflected my shock and was told “it's not my policy”. I asked for a plastic bag to carry the towels to the desk and was met with more huffiness and impoliteness. In the end I actually walked back up to the room, got the towels, waited another 5 minutes for for more guests to be checked in and finally got the towels. I have never been treated so rudely or had to "trade in" towels to get fresh ones. 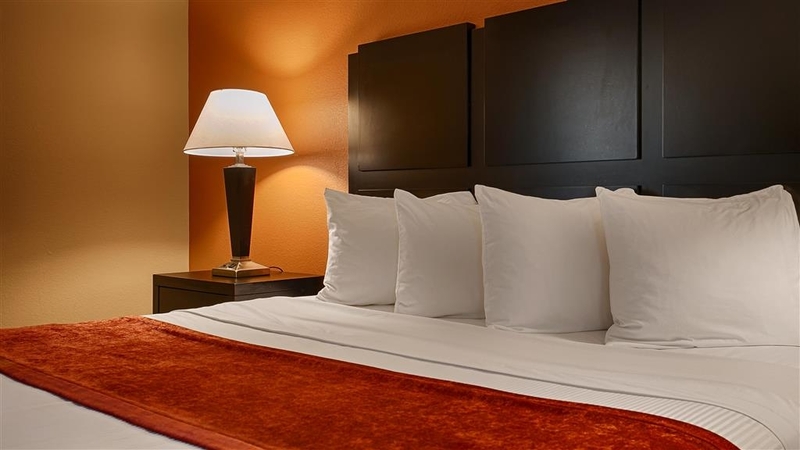 I am very pleased with the quality of this hotel & the staff is very friendly & accomidating . I will deffintly be returning for future stays to this hotel or a Best Western in my area. 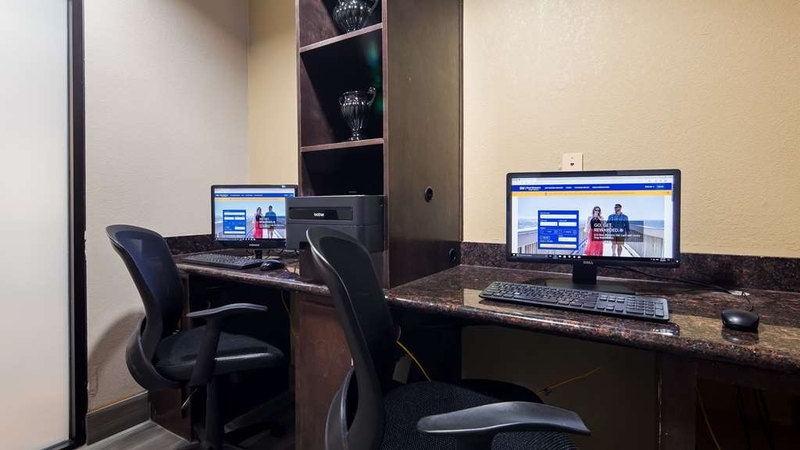 I will also refer Best Western to people that I know for their vacation or business trips. We really appreciate your business and thank you for your feedback. We will look forward to have you stay again with us and provide you with the same experience you had with your recent stay. We were driving from Austin to New Orleans over holiday break and got caught at night in a crazy storm so needed to find a place to spend the night. We tried one of the casino hotels but they were all booked up. I have pretty good luck with BW, so I found this one and they also had good reviews. So happy I did!Not only did they have rooms available, but it was super nice and clean. The room ended up being the nicest and largest room we stayed in on our whole trip! The beds were super comfy. They had the standard free buffet breakfast, nothing exciting but free and got us going on our way with full bellies. I would definitely recommend this hotel for anyone staying in the area, and would stay here again myself if I'm ever in the area. Do not stay there.The were many things broken things. and the rooms stinked. the food was ok. some things were ok if you stay there hope you have better luck than me Best Western Bayou Inn & Suites, Lake Charles, LOUISIANA .. Thank You for taking the time out to complete the survey. We really appreciate the feedback as a learning tool. Also on behalf my entire team, like to apologize for the inconvenience you had during your stay. Hope you will give us another chance to give you better service for your future stay. Read reviews of being in ghetto and musty rooms. When we arrived, we found neither to be the case. Very nice foyer and rooms. Bathrooms had a little dirt in corners of floor, and eggs and sausage were not tasty and too processed. Other than that, overall we were pleased. Thank You for taking the time out to complete the survey. We really appreciate the feedback as a learning tool. Hope you will stay with us again for all your future stay while you are in Lake Charles. 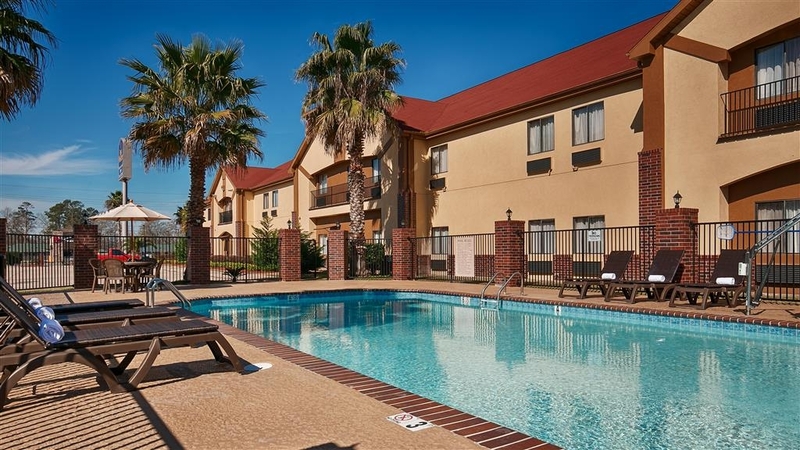 "Easy access to I-10 and Lake Charles"
We stayed here almost 3 weeks while visiting family. The hotel is very clean, it actually smells nice every time you walk in the door. All staff we interacted with were friendly and helpful, as were the housekeeping staff. The beds were comfy and there were plenty of pillows. There was a very comfortable chair/ottoman in the room that you actually wanted to sit in. The free breakfast was nice, with some sort of eggs and breakfast meat every day, plus make your own waffles, cereals, breads, yogurt, juices, etc. There is a fence around the whole property, which made it feel secure. There are local fast food restaurants such as Taco Bell and Church's chicken, and a Dollar store next door. We will definitely make this our home base when visiting Lake Charles. The hotel staff went out of their way to accommodate me. My flight came in late and the rental cars are closed when i got to the airport. I called the hotel and Andre volunteered to pick me up. He went out of his way since he cam and got me in his personal vehicle since the hotel does not offer shuttle service. Thank you Andre for caring. Worst check in ever experienced.Rood,carefree bad attitude,making personal extended call during check in.Mold smell in room each time entering room.Dimly lit room,Maybe to hide dirty carpet.Had to call national number to locate room which I was told at local was not avaible.Turns out I mistakenly booked for wrong day but was not told by local check in person.Only help was done nationally.I was too tired to switch rooms.I will never stay at this location. Location was convenient to Casinos and restaurants. Eat at the original steamboat bills right down the street. Excellent food great price. Hotel staff very nice. There is a Wal-Mart close by and family dollar next door for drinks. 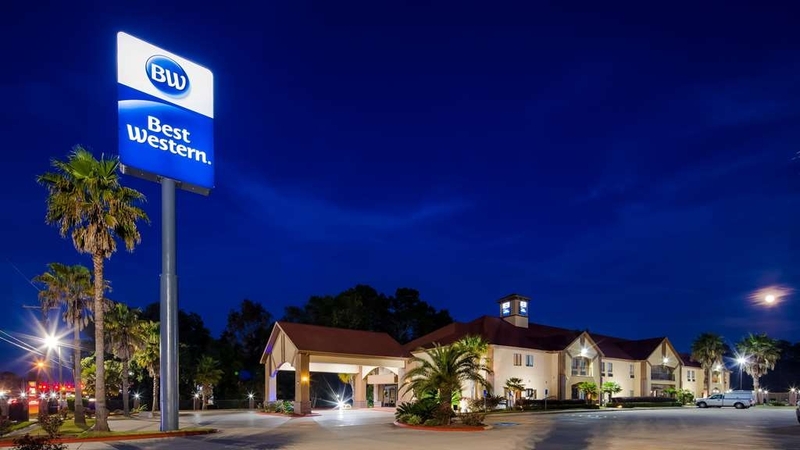 Ive found Best Western to be a pretty reliable name, but this one in Lake Charles is a bit below their usual standards. They arent putting a lot of effort into upkeep. Every surface you can see is worn, stained, or rusted. There isnt a door in the whole hallway without scratch marks. And I have to suspect they are cutting costs on pest control too. I found two little critters in my room with me. A gecko that i caught and carried outside, and later a bug that crawled in bed with me. Which, in fairness, perhaps the gecko would have eaten if I had left him alone. I thought the girl behind the front desk was a little unfriendly when I checked in. To give a few positive marks, the internet worked fine, and my room was quiet. Overall this place was just a disappointment. There must be better options in Lake Charles. Everything in the room is damp to the touch. The bed and pillows feel like we are on moist sponges. Feels so gross one of the weirdest experiences I have ever had at a hotel. Would love to leave and go somewhere else but just will deal with it. The lady at front desk was nice, but wasn't aware of the damp situation. Not sure why, even the second room we were given was DAMP. I don't understand why a room is overly moist. It's so weird! What can I say...it's a Best Western. Check in was fast and easy. 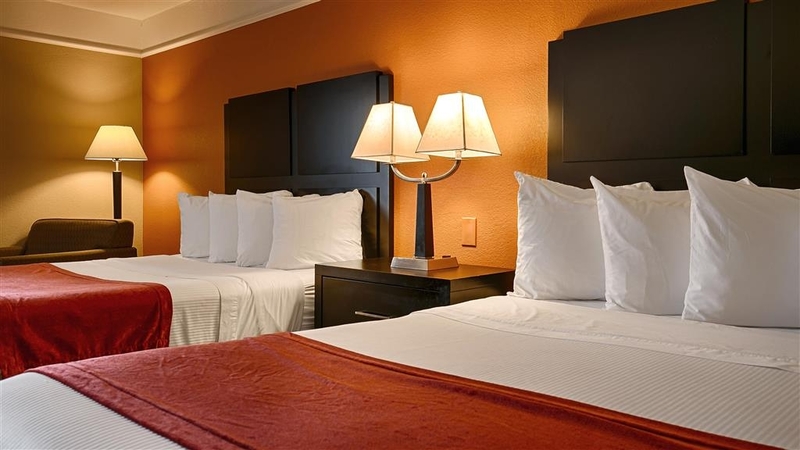 Room was fresh and clean, and the location is perfect if you are traveling east on I-10. Breakfast was good as usual. Plenty of parking.